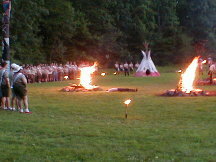 The following photos were taken at a Wednesday evening calling-out ceremony. 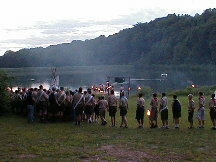 The calling-out ceremony occurs each Wednesday of Boy Scout Summer Camp. 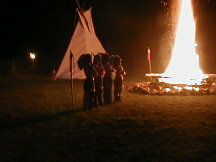 This is the OA Indian Village at Hawk Mountain Scout Reservation. This landscape is transformed under the mask of twilight into a dramatic ceremonial arena. 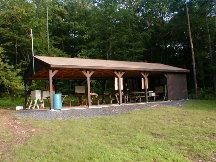 This is the Indian Village Pavilion, which becomes the Headquarters for ceremonial operations. 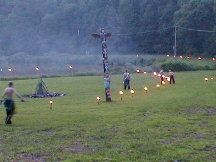 The ceremonial circle is prepared by the Indian Village staff and volunteers from around camp. 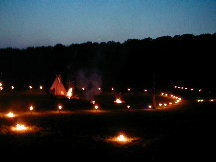 The ceremonial circle stands ready for the arrival of the participants. 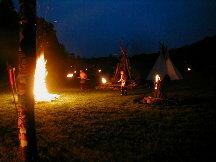 As dusk falls, the campfire burns brightly and cheerfully with embers curling upwards. 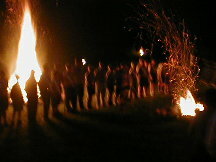 Participants quietly shuffle into the circle to begin the ceremony. 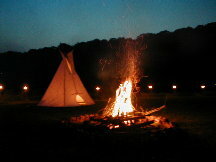 Indian flute music quietly envelopes the circle, emanating from the pavilion. Silently, a raft is launched from the other side of the lake. 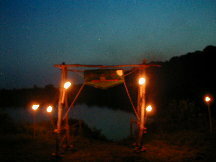 The ceremony principles solemnly stand watch as they glide across the lake. In the meantime, two figures emerge from the forest who represent good and evil. 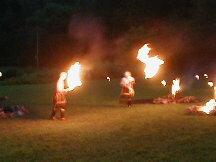 The figures light two fires and concretely illustrate the perpetual battle between good and evil. After a valiant but fruitless struggle, the evil figure succumbs to the forces of good in the world. 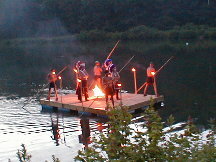 As the battle ends, the raft arrives at a gateway to the lake. The principles enter the circle and deliver an awe inspiring message to the candidates. The principles stand watch as candidates are called out individually. As candidates are selected, they are placed in a line before their Brothers. The candidates are recognized for their accomplishments.